One of the most common objections raised when people discuss the risk of technological unemployment due to the rise of smart machines is “we’ve had the internet for 15 years and productivity growth is slowing down, not speeding up.” This has bothered many commentators and caused a lot of head-scratching. Inspired by a May blog post by Andrew McAfee I decided to take a look at the macroeconomic data on GDP, labor hours, and productivity. My sources were labor hours from the Bureau of Labor Statistics and GDP data from the Bureau of Economic Analysis. Let’s start with a top level perspective on the economy in the “internet age”. BLS and BEA have comparable data sets through 2013, so all of this analysis is for the period 1997–2013. All GDP numbers are in chained 2009 dollars. 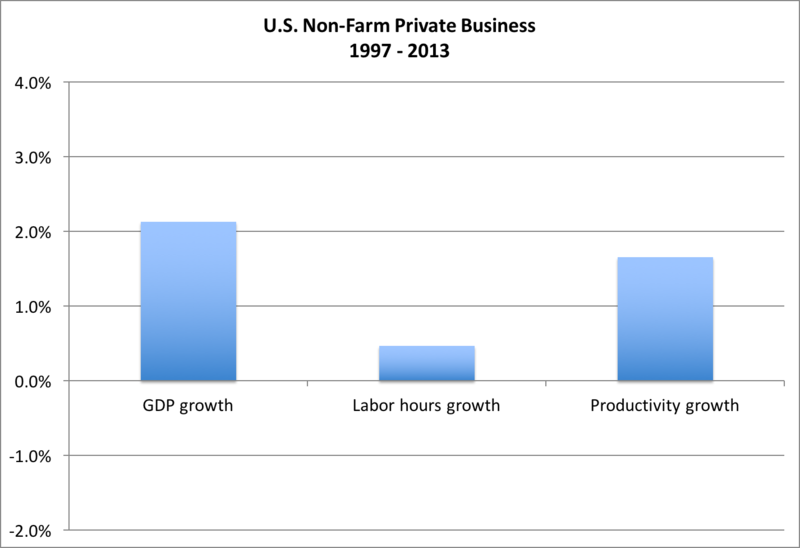 The analysis is for non-farm, private business activity, which is about 85% of total GDP in the U.S. 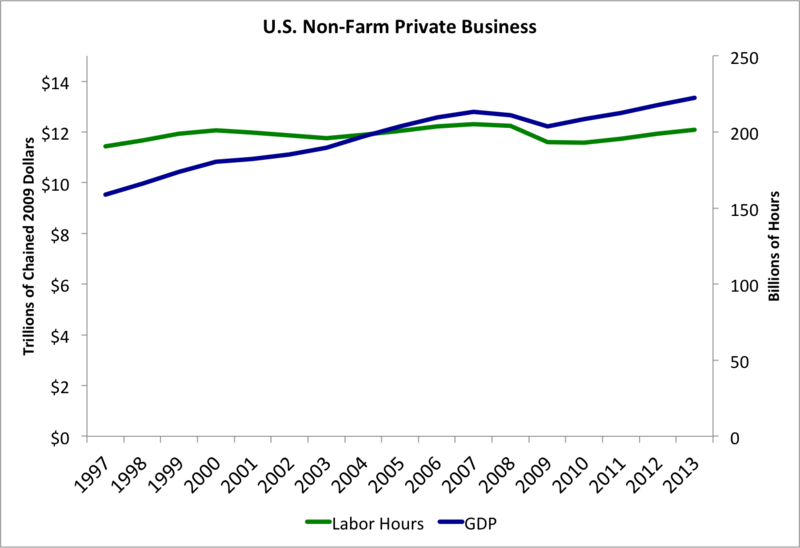 When you look at overall non-farm, private business GDP and labor hours the first thing that jumps out at you is that the economy is growing without really adding any additional labor. 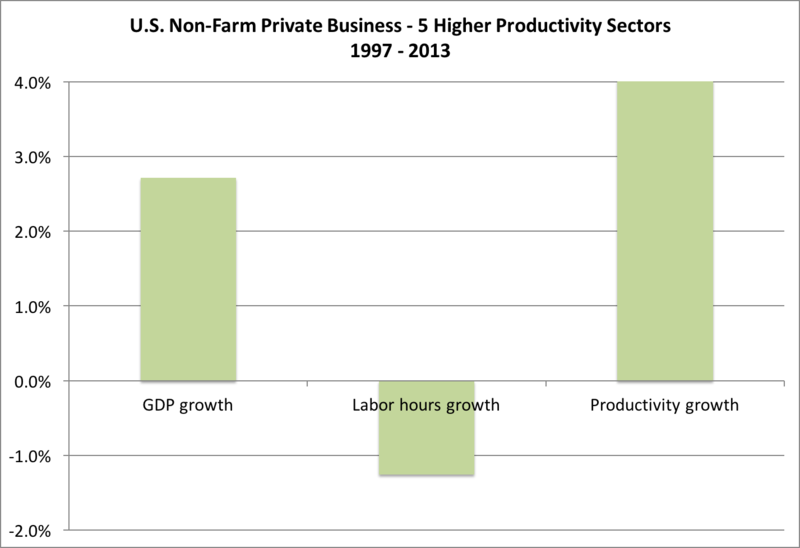 From 1997 to 2013 this portion of GDP grew about 40% while total labor hours grew about 6%. The annualized growth rates for GDP, labor hours, and labor productivity (output divided by labor hours) show what the commentators are concerned about — recent productivity growth at 1.8% is significantly slower than historical averages, especially compared to the post-war period. If AI and robots are really taking our jobs, the argument goes, we should be seeing skyrocketing productivity gains. 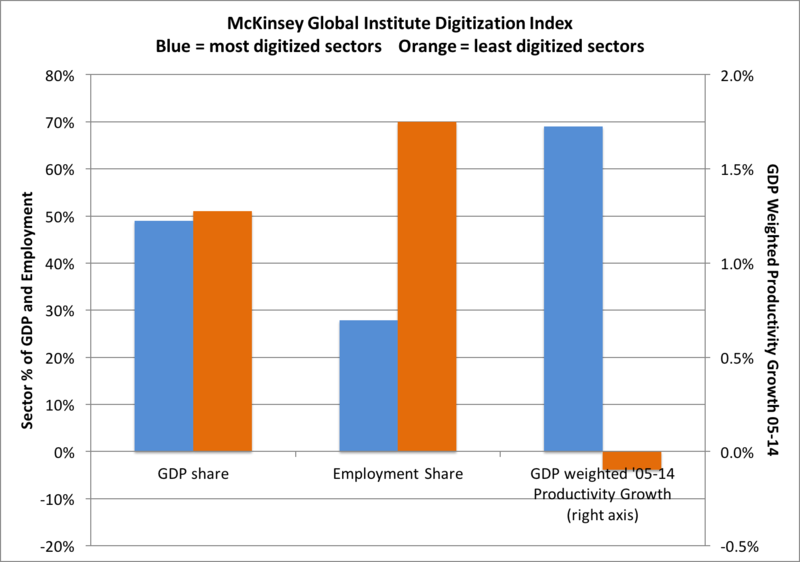 The top five most productive sectors (in green) represent about half of GDP and the bottom six sectors (in orange) make up the other half of GDP. Let’s see what has happened to GDP and labor hours for these two groups over this time period. The highest productivity sectors (finance, information, mining, durable and non-durable manufacturing) have grown their share of GDP and reduced their share of total labor hours in the economy. 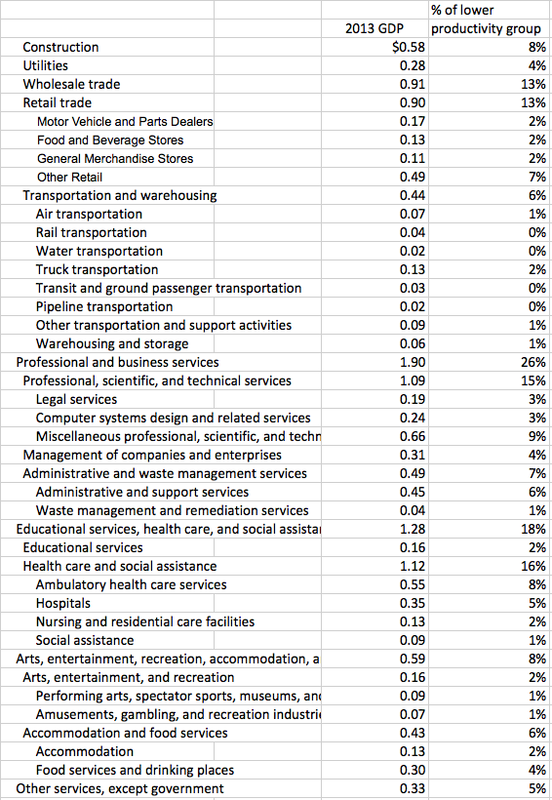 What is somewhat startling is that these five sectors produce 46% of GDP with only 22% of all labor hours. 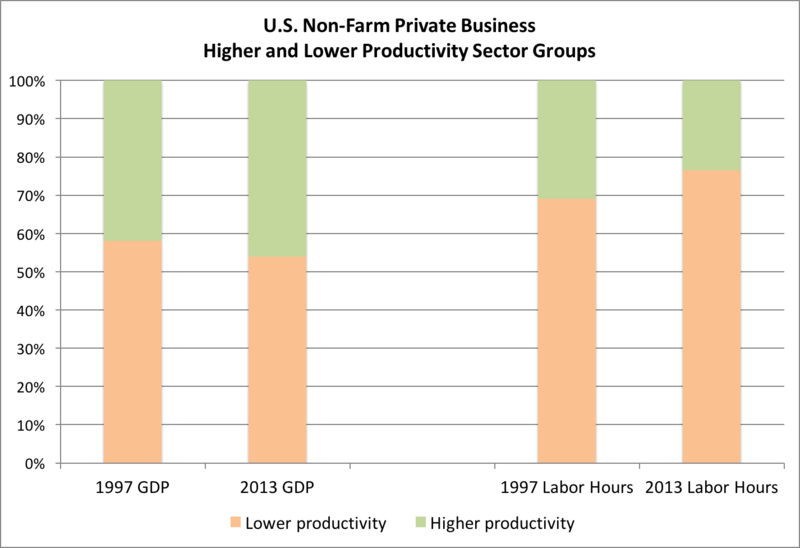 Let’s look closer at the rates of growth of GDP, labor and productivity in each of these groups for this time period. The six lower productivity sectors have had pretty weak GDP growth of 1.7% and productivity growth from 1997 to 2013 of only 0.6%. This is because labor hours in this group grew from 124 billion to 148 billion over the 16 years. So now what Andrew McAfee suggested really seems to make sense. The sectors most easily impacted by the software, robotics, networking and communication technologies of the last 15 years have seen tremendous productivity gains, growing their GDP by ~50% while reducing labor hours by ~20%. The “service” sectors that are more labor intensive with harder-to-automate functions have only grown their GDP by ~30% while increasing labor hours by ~19%. From 1997–2013 we added 10 billion hours of labor into the least productive sectors of the economy and shifted another 10 billion hours from the most productive sectors to the least productive sectors. 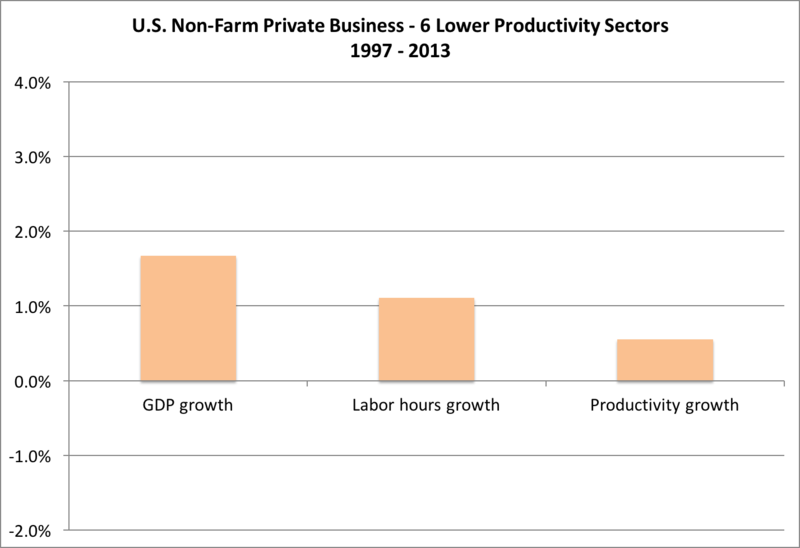 Is any wonder productivity growth hasn’t looked so great? So the answer to the objection “where’s the productivity?” is this: it’s in the sectors where the technology of the last 15 years has been most easily and quickly deployed. Let’s look at the $7.1 trillion of GDP in the lower productivity sectors in more detail, using the finer grained BEA information. The key question we need to ask ourselves about “robots taking our jobs” is whether the technologies just starting to emerge as practical today — autonomous vehicles, IoT, personalized genomic medicine, virtual and augmented reality, 3D printing, machine learning operating on big data, mobile and dextrous robots, cognitive and emotional computing — will have a dramatic impact on productivity in these sectors going forward. When I look at more than half of the GDP in this group in transportation, retail, health care, and restaurants/hotels, I’m pretty confident the answer is YES. And that means we may very well see a dramatic reduction in the need for labor hours in this group too. That will be great for overall productivity and wealth generation. But not so great for individuals who still need to sell their labor in order to survive. Yet another reason to consider something like an unconditional basic income, to provide a universal floor on which people can build their lives.